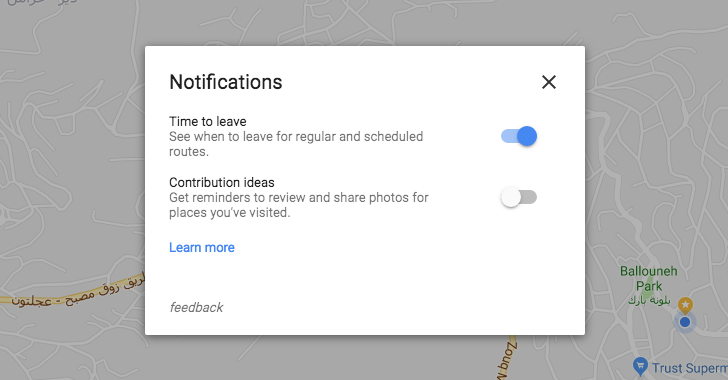 Google Maps started offering notifications on the web around January, but at the time, they were only nudges to get Local Guides to contribute more. Recently (we're not sure how recently), a second option was added to Maps' Notifications toggles (accessible from the side menu on the web): Time to leave. Turning it on will allow Maps on the web to check your current location, which events (with location) are coming up on your calendar, how long you need to get to them given the traffic conditions and expectations, and then pop up a notification to tell you when it's time to leave with a shortcut for directions. According to Artem, who got the notification below, it doesn't dismiss after a certain time and you have to manually close it. If you depend on these time to leave notifications and have noticed they were becoming unreliable on mobile, and if you sit at a computer most of the time, you may want to turn this setting on and see if it works better than the Android one. There's no harm in being nudged in ten different ways to close those cute puppy videos and get going to your aunt's birthday. I shall subtly tell my husband to enable it on his work computer.